More people are playing Predictalot today than Mafia Wars or Zynga Poker… On Yahoo!, that is. 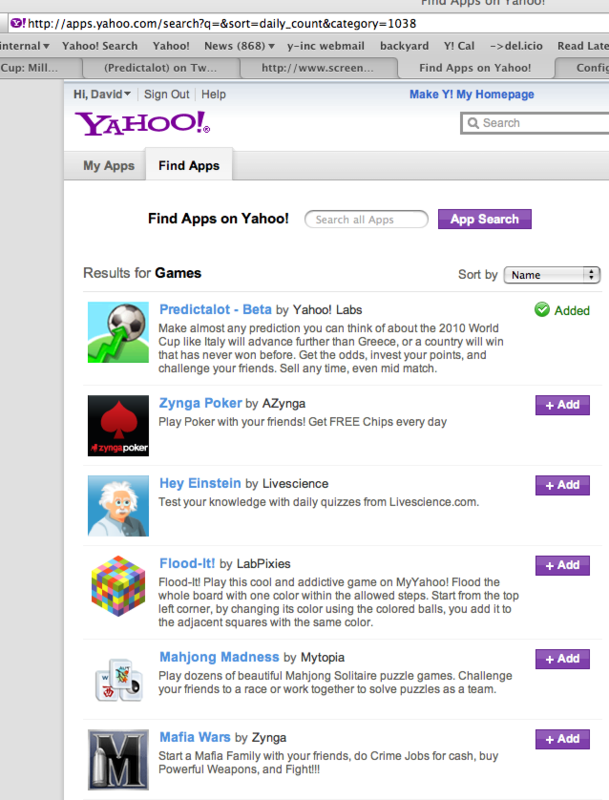 In fact, Predictalot is the #1 game app on Yahoo! Apps by daily count. By monthly count, we are 5th and rising. A prediction is being made about every three minutes. Previous PostPredictalot for World Cup: Millions of predictions, stock market actionNext PostWhy automated market makers? That’s right – Predictalot already became the global game. Bringing Predictalot to life has been a truly interdisciplinary effort by Yahoo team. They are great ! wow, pretty cool stuff I just found predictalot, nice work! I wonder now that the world cup is almost over, will you cross check the results and adjust the prediction algorithms?